So last Monday was our last project shoot at FIP. Theme was Haute Couture. Our team's concept was storybook fairytales. 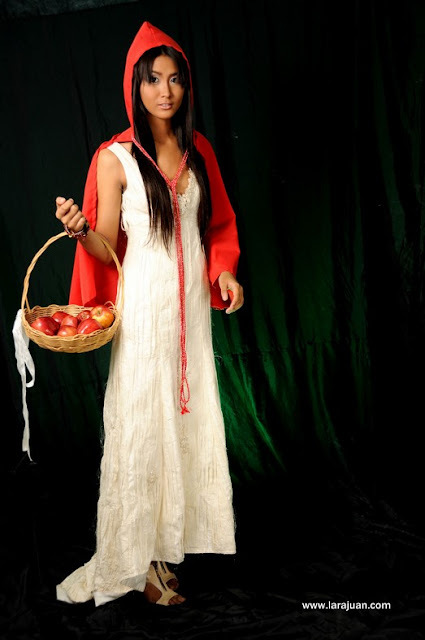 I opted for Little Red Riding Hood. Here are the final pics and some behind the scene pics. Hope we nailed it! I know it should have been bread in the basket. But I wanted to use apples to reflect more colors. Blue dress by Dimple Lim. Thanks Melvin for the wonderful photos!!! Visit our photgrapher's site: www.larajuan.com. Posh, Jody and Jay Wee. That's Melvin! Our friendly and talented photographer. That's it. Exhibit on Monday. I still don't have the final photos of our Women's wear shoot (will blog about that soon). It's sad classes are over. Will miss my classmates! Well I can enroll for sewing classes next. Hee. Fantastic pictures, i absolutely love all of the styling! Really gorgeous. looks like you had so much fun in the shoot. my fave is the witch look...so fierce! Oh wow! It would have been so great if you had a forest to pose in! haha.